United Company Rusal, the Russian aluminium monopoly headed by Oleg Deripaska (image right), has won a fresh round in its battle to keep control of its Nigerian aluminium smelter, and ward off claims from a Nigerian-American group whom it defeated in the privatization of the asset almost a decade ago. 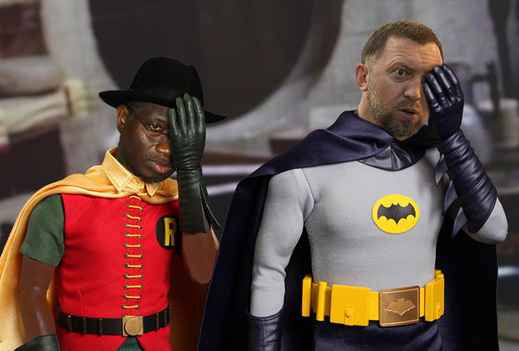 For the time being, the Nigerian government, headed by President Goodluck Jonathan (left), will neither support Rusal, nor act against it. The indecisive Jonathan lost majority control of the Nigerian House of Representatives in December, and he faces an uncertain presidential election in a year’s time. BFIG’s damages claim for $2.8 billion against Rusal had been scheduled to start on October 7 last, following the defeat of Rusal’s application to dismiss the claim outright in June of 2013. But the October trial was halted when Rusal argued that because the Nigerian Government had already agreed to indemnify Rusal for challenges to the smelter privatization in June 2004, the government agencies responsible then – the Bureau of Public Enterprises and the National Council on Privatization — should be joined as defendants with Rusal now. Judge Okeke has ruled that the National Council is not a juridical body, and that the Bureau of Public Enterprises (BPE) had already been through the courts on the issue. In July of 2012, Nigeria’s Supreme Court, the country’s highest court of appeal, judged that BPE had violated the law and the privatization rules in awarding the Aluminium Smelter Company of Nigeria (ALSCON) to Rusal after rejecting a higher bid from BFIG. That story can be read here. BFIG has been unable to get the Nigerian courts or the Nigerian Government to enforce the July 2012 Supreme Court judgement. BPE refuses to take the smelter from Rusal’s control. The next date in court for a hearing on this issue is March 4. In parallel, Rusal has been in the London Court of International Arbitration (LCIA) since August 2012 to challenge the rulings of the Nigerian courts, and to decide the contentious issues of the privatization contract afresh. The arbitration panel was appointed in January 2013; one hearing was held the following July to consider preliminary issues, including the Nigerian Government’s challenge to the jurisdiction of the LCIA to rule on a case already decided by the Nigerian courts. The LCIA hasn’t ruled on that point yet. Until it does, the arbitration judges will not consider the facts of the disputed ALSCON privatization. Rusal has also put pressure on BFIG and its executives in federal US court in Los Angeles, seeking a US court order for disclosure of financial and other business details allegedly in support of the London proceeding. After a hearing last October before US Magistrate Carla Woerhle, an order was issued on December 11, allowing enforcement of Rusal’s subpoenas but restricting what Rusal can request, and what BFIG should disclose. The US judge said she is putting a protective screen around the evidence BFIG aims to present in its Nigerian damages case. In his January 27 Nigerian High Court ruling, Judge Okeke decided that since BFIG is accusing high government officials of participating illegally and corruptly in the ALSCON privatization, the Attorney-General and the Justice Minister should join Rusal at the defendants’ table. The president at the time of Rusal’s takeover was Army general, Oluṣẹgun Ọbasanjọ. Rusal restarted the ALSCON smelter in 2008, but production that year was just 9,000 tonnes. In 2009 the output was 11,000 tonnes; in 2010, 18,000 tonnes; in 2011, 15,000 tonnes; in 2012, 22,000 tonnes. Last year output was 2,000 tonnes. Under Rusal management the plant has never reached its design capacity of 193,000 tonnes per annum. For the backfile on the conflict between Rusal and BFIG, read this.